Youths are the pillars of society, once the youths success in their endeavours after qualifying their academic carrier, said Executive Engineer, PWD, Capital Division B Er. Tana Nilam Tara while addressing the youths at a function of 6th felicitation function of the United leil Tara Youth Foundation (ULTYF) held at city hotel. Nilam said that the youths are the pillar of society and future of country, the development and future of co try lied in the hand of the youths, he emphasis on hard labour with sincerity. He also appeal the youths to respect elders and love younger. ULTYF President Debia Muj, General Secretary Techi Peko Tara, Organising Chairman Techi Batt, Organising Secretary Techi Mupu among other spoke on the occasion. A total of 11 youths who received academic in Class-X, XII art & Science, University and NEET. 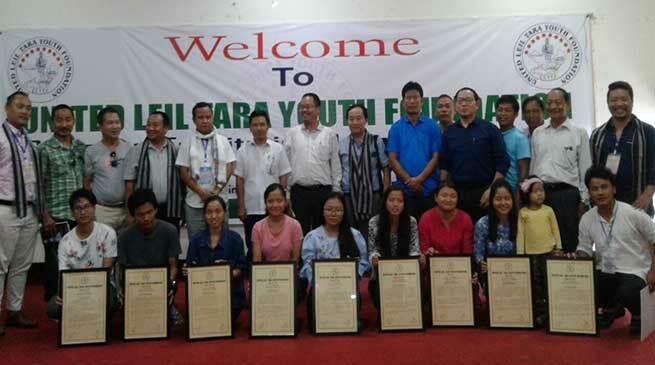 Techi Tina Tara of Papu hill, Naharlagun, Techi Yamang of Nyopang, Silsango, Techi Seepi of Deb, Sagalee, Techi Katung of Depra, Sangdupota and all four got 10 CGPA in Class-X. Techi Yamin of Lengka Balijan, Tana Yakar of Habia, Balijan exhale in Class-XII (Arts) while Techi Takum of Lekhi, Naharlagun and Tabo Techi of Longpung, Pakke Kessang exhale in Class-XII (Science). Raha Solomi of Lenka Balijan (BA 3rd rank) and Techi Modi of Karoi, Sagalee exhale in (BA 6th rank).Techi Takam compete NEET 252 in ST catogery.